In the last installment, I briefly introduced the topic of technology and personhood. For in this treatment, I will focus on one’s sociological angst regarding personalized technology. Here, I will rely heavily on Star Trek: Voyager’s Emergency Medical Hologram (EMH) and the crew’s reluctance to accept him as a person. This post will continue to introduce the correlation between technology and personhood. This post serves as an extended introduction which builds a bit off the first piece. Thus, this post’s purpose is not to delve deep into thought, but rather continue to ponder the connection between these two topics. Voyager is a series focused on a ship, holding the same name as the series, which is lost in space. The ship’s physician was killed in action in the pilot episode. 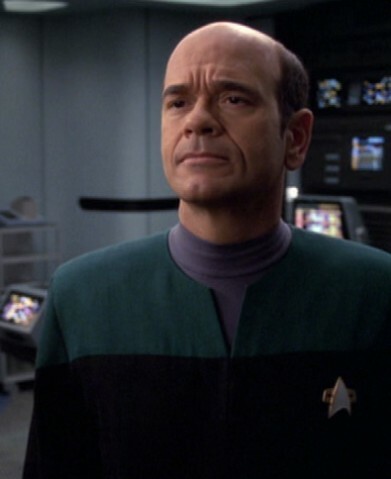 Voyager is equipped with the EMH, a holographic doctor which can be activated in an emergency to assist the medical team or, as in Voyager’s situation, the medical staff is killed. Since Voyager is lost in space, the EMH must be used long-term – a task which he was not created for. Unlike The Next Generation’s Data, the EMH looks human in every way (he is a holographic duplicate of his creator). The EMH can imitate all human reactions. Most notably, in the beginning of the series, his bedside manner needs some work. EMH has certain restrictions. Because he is a hologram he is unable to leave the medical room as the ship is not equipped with holo-emitters (excuse the technobabble, but I cannot describe some fictional technology without using the show’s terminology). EMH is therefore like a prisoner. He is also not capable of controlling his own program. He cannot simply turn himself on or off under his own volition. Early in Voyager’s run, EMH was not treated as human. One character worked closely with EMH in case the ship needed a field medic. She noticed the abrasive and rude manner which EMH received from the crew. Ultimately, this became overwhelming that the ship’s captain was informed. The captain was not receptive to treating EMH as a human. While the captain understood the sympathy, she ultimately stated that he is “just a hologram.” This upset the crewmember to the point which she blurted out, “he is alive.” The captain promptly countered a response, “No, he’s not.” Captain Janeway visited the Doctor directly, and hesitantly gave him the ability to turn his program off by his own volition. She no longer looked at him as a hologram, but as a full member of her crew. One need not only look to science fiction to see the hesitation towards technology. German existentialist, Martin Heidegger, once wrote to such lengths about embracing technology. He said, “Thus we shall never experience our relationship to the essence of technology so long as we merely conceive and push forward the technological, put up with it, or evade it. Everywhere we remain unfree and chained to technology, whether we passionately affirm or deny it. But we are delivered over to it in the worst possible way when we regard it as something neutral” Heidegger rightly asserts that technology is unavoidable. One cannot escape from its development. But he puts into focus what is often ignored: the questioning of technology. Technology has both its benefits and its consequences, but the greatest evil of technology arises when we do not question its effect on human society. Technology, as Heidegger so aptly put it, is not neutral. It has influence on our life – some for the good, others for the bad. I will not here further question Janeway’s reluctance in treating the EMH as a human. What I will commend, however, is her ability to discern the use of technology on her ship. Just how much freedom should she allow this walking, talking piece of technology? Should she grant it rights because it looks human? Does she allow the crew to become attached to it? In a serious conflict, does she defend the technology, or a real person involved? These may sound like questions simply relegated to science fiction, but one can extrapolate the significance to daily life. We need to question how much of a role technology plays in our daily tasks. Does it distract us from engaging with other people, or perhaps enhance the communication? Does it make one lose attention? Do we talk to the phone, rather than to people (yes, that is directed towards Siri users)? How we answer these questions will help clarify Heidegger’s point. Technological advancement has not a neutral influence, but positive and negative ones. Users of technology must have a virtue behind their usage. While it is not my philosophical bend, I do value the thought of virtue epistemology (epistemology is the branch of philosophy which studies knowledge and how it is acquired). Virtue epistemology strives not only at the acquisition of knowledge, but also focuses on how one comes to possess knowledge. This virtuous endeavor ought be utilized in how culture engages technology. Some technological advances have an objective value – good or bad – but the user is the one who seemingly benefits from the technology. When obtaining new technology, it is virtuous for the user to examine, evaluate, study and discern how best the technology. Identify the benefits and consequences not only of the technology itself, but also of your interaction and responses to it. Do not be act in haste and disregard important parts of your life for the quick accessibility and convenience of technology. Question the device, your motive and the outcome. Star Trek: Voyager, episode 1×07, “Eye of the Needle.” First broadcast Februrary 20, 1995 by UPN. Directed by Winrich Kolbe and written by Bill Dial and Jeri Taylor. Martin Heidegger, The Question Concerning Technology (New York: Harper Touchbooks, 1982), 4.